This Our Lady Guadalupe Auto Rosary is designed to hang on the rear-view mirror of your car, but it can be used virtually anywhere. Like all of our products, it comes with our money-back guarantee. 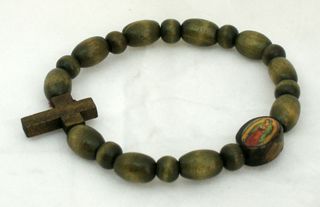 Our Lady Guadalupe Auto Rosary. Our 6 Millimeter Bead Aurora Borealis Peridot/August Rosary features our money-back guarantee. NOTE: The photo may only show part of this product, but the 6 Millimeter Bead Aurora Borealis Peridot/August Rosary is a full rosary.